The Japanese Spitz is a bold, loyal, active, playful, affectionate and happy companion. He seems to be smiling all the time! He thrives on being with his owner, and wants to go with you wherever you go. He can sit and warm himself in your lap, but he is not the kind of dog who sleeps all day--he's lively and full of fun, even well past his puppy years. He is not the kind of dog who can left be alone in a yard. If bored or ignored, he can become depressed, start barking or turn mischievous, and with his excellent jumping skills can leap right over a fence. He is a housedog and needs plenty of family activity and attention. Although he is fairly energetic, he doesn't require strenuous exercise and is as happy playing inside as outdoors. He loves games and balls, running through the sprinklers in the yard, or jogging at your side. He excels at dog sports like agility. At a minimum he needs a long daily walk and chances to run and play freely in a securely fenced area. When outdoors, he should always be on a leash or in a safely enclosed space, as he might chase small animals. He is generally good with other dogs and pets, especially if he is raised with them as a puppy. He is good with children, and has the patience and playfulness to be a companion to young ones. Around strangers he is slightly suspicious, and will bark loudly at visitors until he gets to know them. He is best approached very gently rather than rushed toward. He is a good watchdog because he is very protective of his family, and has keen senses along with a loud and forceful bark. He can sometimes bark too much and must be taught to quiet down on command. He is easy to train and learns quickly. He is eager to please you, but can occasionally be independent and demonstrate a strong will of his own. You must be fair and consistent to train him. He is a very clean, odorless, almost cat-like in cleanliness-standards dog, but he is an extremely high shedder, and so would not be a good pet if you dislike vacuuming regularly or seeing hair on your couch. 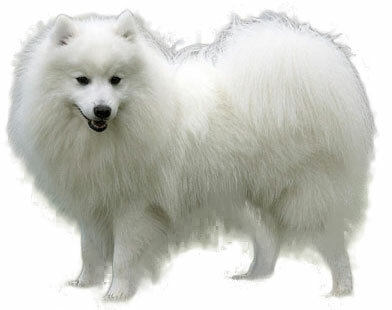 The Japanese Spitz is 12 to 15 inches tall (to shoulders) and weighs 11 to 22 pounds. He has a medium-length, double coat consisting of a straight outer coat and a short, soft, thick undercoat. His coat color is white. He only needs an occasional brushing. You might find yourself brushing him daily, however, to remove the massive amounts of loose hair he sheds before it falls out in your home. The Japanese Spitz is probably descended from the Siberian Samoyed and from German Spitz dogs who arrived in Japan in the late 19th century. He was bred to be a companion dog, and was first shown in Tokyo in 1921. In 1948 he was admitted to the Japanese Kennel Club, and during the 1950's he became very popular in Japan. At about the same time he was introduced to Europe and North America. Although not as popular as he once was in his home country, he is becoming an increasingly well-known dog around the world. © allsmalldogbreeds.com. All rights reserved.